I just went out to visit our Dairyman Vineyard in Sonoma County’s Russian River Valley wanting to see how the vineyard fared during the recent rainstorms and high winds. Thankfully I didn’t see any damage to the grapevines, trellising or equipment due to the wind, and the rain is most definitely welcome. The reservoir levels are far healthier than they were this time last year. I was also happy that the rain, along with an earlier series of storms, have greened up the cover crop in between the vines. That cover provides vital erosion control and also produces natural nutrition for the vines. 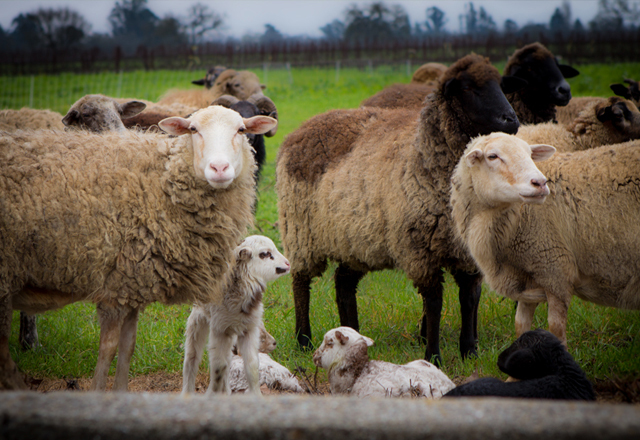 We use sheep in the vineyard to mow the grass, so we’re less reliant on machinery, fuels, fertilizers, hand labor, irrigation and herbicides—and it reduces carbon emissions into the atmosphere. When we thin the grapevine canopy later in the season, the sheep eat the clippings we place on the ground and convert them into manure. Their urine makes great fertilizer, too! We’re looking ahead to a week of mild spring weather with no frost warnings. So far, an excellent start to the 2015 vintage. – Joseph Wagner, Owner & Winemaker.